In the absence of any deeds for the property we have had to rely on the census records and rate books for details of the occupants of the house that is now 4 Bath Road in Thornbury. We are not sure who lived in the house in the 1841 and 1851 Censuses. Ann Luster – the 1861 Census shows the house was occupied by Ann Luster and her daughter Martha Ann. Ann was a widowed laundress aged 69 from Brinkworth in Wiltshire. Martha Ann’s age is difficult to read but looks as if it is over 40. We think Ann was married to John Luster who died and was buried on 1st September 1848 aged 57. Henry Pratt – the 1880 Rate Book and the 1881 Census shows that the house was occupied by Henry Pratt. The Census shows that Henry was a baker aged 32 from Berkeley and his wife, Elizabeth was aged 32 and from Thornbury. Their children were: Bessie aged 8, Henry J aged 5, Rosina aged 3, Austin aged 2 and Lucy aged 6 months. Also living with them (according to the Census) was Henry’s brother, Henry also a baker aged 26. (We think that Henry’s brother’s name should be Edward who was baptised on 4th December 1853). Henry was baptised in Berkeley on 11th June 1848, the son of William Pratt, a labourer and his wife, Lucy. On 1st October 1871 Henry married Elizabeth Hinder in Thornbury. Elizabeth was baptised on 28th January 1849, the daughter of James Hinder, a labourer and his wife, Eliza, from Kington. They had several children whilst living in Thornbury: Bessie baptised on 4th August 1872, Henry James baptised on 27th June 1875, Rosina baptised on 4th May 1879, Austin William baptised on 4th May 1879 and Lucy baptised on 5th December 1880. By 1883 or 1884 the family had moved to Bristol. In the 1891 Census they were living in Nelson Villa, Bedminster where Henry continued to be a baker. Bessie had become a clerk aged 18, Harry a general errand boy aged 15, Rosina a dressmaker’s apprentice aged 13 and there were three other children: Austin aged 12, Lucy aged 10 and Annie aged 7 who was born in Bristol. By 1901 the family were living in Lower Pearl Street, Ashton Gate, Bristol. Henry was still a baker. Rosina was a dressmaker, Lucy and Annie E were cigar makers. Henry and Elizabeth’s son, Henry J was now married to Lavinia and they were sharing the house with his parents. Henry Jnr was also a baker. We know from a document dated 20th April 1885 made for tax purposes that the properties that became 2 and 4 Bath Road were described as “two cottages and large gardens adjoining each other situate in Bulls otherwise Bullseys Lane” with a stable adjoining. At that time one property was said to be “void” and the other to be occupied by Daniel Ball. At present we cannot be certain which property was which. Henry Pritchard – the 1887 and 1890 Rate Books and the 1891 Census show that the house was occupied by Henry Pritchard. In the 1891 Census Henry was a painter and house decorator aged 35 from Rockhampton who was living with his wife, Sarah aged 35 from Thornbury and their children: Annie aged 14, Edward Henry aged 13, Mabel aged 11, Ella aged 8, Victor aged 5 (born on 3rd July 1885), Gilbert Maurice aged 3 and Olive aged 3 months. All the children were born in Thornbury except Edward Henry who was born in Rockhampton. Ella died aged 16 an d was buried in Thornbury Cemetery on 18th June 1899. Henry was baptised in Rockhampton on 13th June 1858, the son of John Pritchard, a dealer and his wife Caroline who were living at Newton. Henry married ‘Sarah Malpas’ in Bristol on 26th March 1877. Sarah was the daughter of Maurice and Eliza ‘Malpass.’ The spelling appears to vary. In the 1881 Census Henry and Sarah were living in Crossways. Henry had become a painter and plasterer. In 1901 they were still living at 4 Bath Road. Their son, Victor, had become a mason’s boy aged 15 and they had one extra son, Godfrey who was then aged 3. In 1903 the family must have still been living at the house. We know this because Mabel Pitchard’s son Lawrence was baptised on 25th November 1903 and the address given was Lower Bath Road. We believe this would have been the address of this house at that time. The Rate Books show they were still there in 1910, but we think they moved around this time back to Crossways. We know from the deeds of Prospect House that it was this cottage where the family lived for a short time and they were there at the time of the 1911 census. Henry was a plasterer and tiler and he and Sarah were living in Crossways with their son Gilbert. By 1912 they had moved away from Prospect House, but we understand that they continued living in the Crossways area of Thornbury. 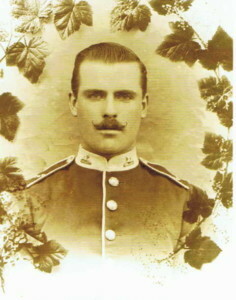 Henry’s son, Gilbert Maurice, married Florence Jessie Scott in the West Ham area of London in 1908. The 1911 Census shows that they were living at 36 Harrow Road, Leytonstone in London. They had three children, Olive aged 2, Edward aged 1 and Constance. ‘Edward’ was born in West Ham on 17th January 1910 and his full name was Gilbert Edward. During the War, at least two of the Pritchard children fought. 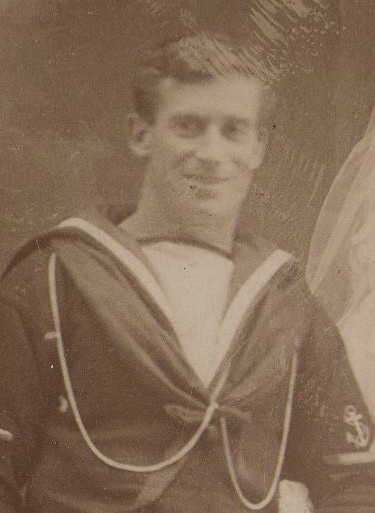 We know that Victor joined the Royal Navy in 1903. He was described as a blacksmith’s mate, 5ft 2 1/4 inches, brown hair, grey eyes, fair hair with a tattoo of ‘Lucy’ across a heart on right forearm. He served on numerous ships and finally left the service in 1925. The photograph here shows Victor on his wedding day when he married Jessie Hunt at Potland in 1915. Gilbert was serving as a Private in the 1st Battalion Gloucester Regiment when he was killed on 2nd November 1914. He is remembered at Ypres (Menin Gate) Memorial. Gilbert’s widow, Florence, married again in 1918 to George Skuse. on 23rd August 1929. Henry appears in the Electoral Register in Crossways until at least 1935. He died in Thornbury Hospital aged 81 and was buried in Thornbury Cemetery on 15th December 1937. Herbert & Jane Sherborne – the Sherbornes occupied the house for many years during the 1900s. The 1910 Electoral Register lists Herbert Sherborne. His name and that of his Jane are shown throughout many records. Herbert Sherborne was born in Luckington, Wiltshire in 1867, the son of Richard Sherborne, a carpenter and his wife, Maria M. He married Amelia Dora Grant in Clutton in 1891. The 1891 Census shows them living at Watleys End, Winterborne. Herbert was a grocer and carpenter aged 23 and Amelia was aged 23 from Minchinhampton. The 1894 Rate Book shows that they had moved to live in 12 Pullins Green, Thornbury. They had a daughter Gladys Elsie baptised in the Congregational Church on 12th April 1892. Amelia Dora died aged 26 and she was buried on 28th February 1896. In the 1901 Census Herbert was a widowed carpenter lodging at 21 St John Street. Gladys Elsie was living with her grandparents in Luckington. In 1907 Herbert married again – this time to Jane Baylis. Jane was born about 1865, the daughter of Henry Baylis the carrier and farmer and his wife, Amelia. By 1910 Herbert and Jane had moved into 4 Bath Road, right opposite Jane’s parents who lived at number 1 Bath Road. The 1911 Census shows them living there. Herbert is described as a carpenter. We have traced a report in the Gazette dated 13th July 1918 which mentions that a cottage in Thornbury belonging to the Estate of Henry Baylis was bought by ‘Henry’ Sherborne for £150. This cottage was the one opposite which became 3 Bath Road. The 1926 Rate Book indicates that Henry owned both number 2 and 4 Bath Road although he is not shown as occupying either of the houses. The name of Louisa Alsop is listed as having lived in number 4, but her name is crossed through, indicating that she had recently vacated the house. We have been told that the Sherbornes lived in the house in living memory. They are listed as living in Lower Bath Road in the 1927 Electoral Register. They carried on living here all their lives. Jane died on 11th May 1938 aged 73 years. The 1939 Trade Directory shows that Herbert was the Secretary of the Ancient Order of Foresters (Court of Pride). We have been told that he may have been a Secretary of a Benefit Society. He died on 4th January 1959 aged 91 years. The Electoral Registers show that Hilda Osborne was sharing the house with Herbert from 1954 until at least 1954. We don’t know much about Hilda, only that on 3rd April 1956, she married John Harry Lane. The marriage certificate shows that Hilda was aged 36 and the daughter of William Osborne deceased agricultural contractor and that John was a farmer aged 36 and son of Wilfred Lane farmer.